A well maintained hedge can provide, privacy, security and a good boundary to your garden but without regular trimming it can soon lose it’s shape and grow out of control. 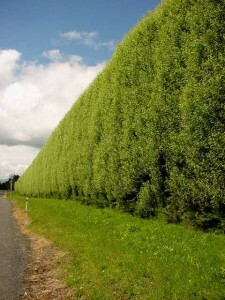 Your formal evergreen hedges should be trimmed two-three times a year while they are actively growing. Fast-growing Conifer hedges such as Leyandii need particular attention or can very soon outgrow their location. 5. Cutting the side of conifers too hard leads to sun and wind scorching causing leaf needles to go brown. If you are not confident, don’t have the tools or feel you are not fit for the job then contact Cairns Tree Surgery in Erskine. Our professional tree surgeons will provide you with a free no obligation quote. We can provide advice on tree and plant care as well as services such as: hedge trimming, pruning, felling, fencing, garden tidy and landscaping. We cover Erskine, Inchinnan, Bishopton, Houston, Bridge of Weir, Kilmacolm,Langbank, Paisley, Glasgow and much of West Central Scotland.